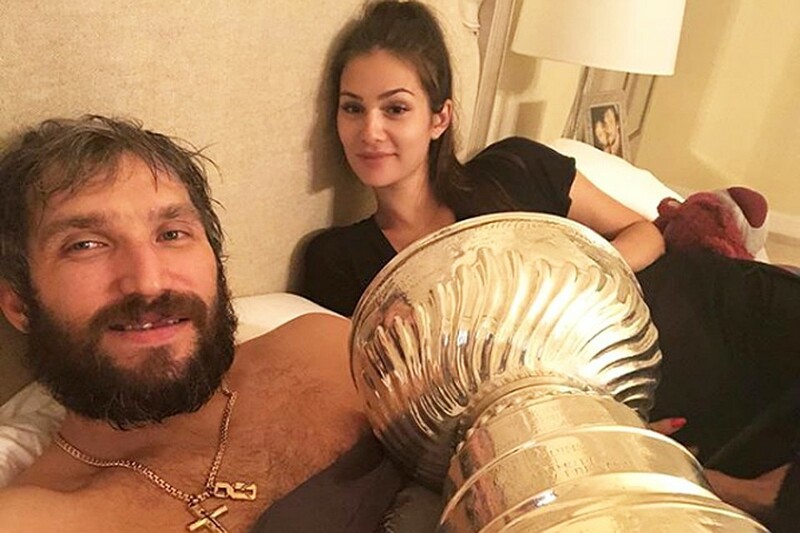 Now Alexander Ovechkin and Anastasia Shubskaya sleep with the Stanley Cup. Photo: Instagram. Recently Alexander Ovechkin won a great victory - the Russian hockey player and his club "Washington Capitals" for the first time in history won the Stanley Cup. And when the athlete was photographed with his wife Anastasia Shubskaya during the awards ceremony, it became absolutely clear that Alexander was to be congratulated not only on the prize. 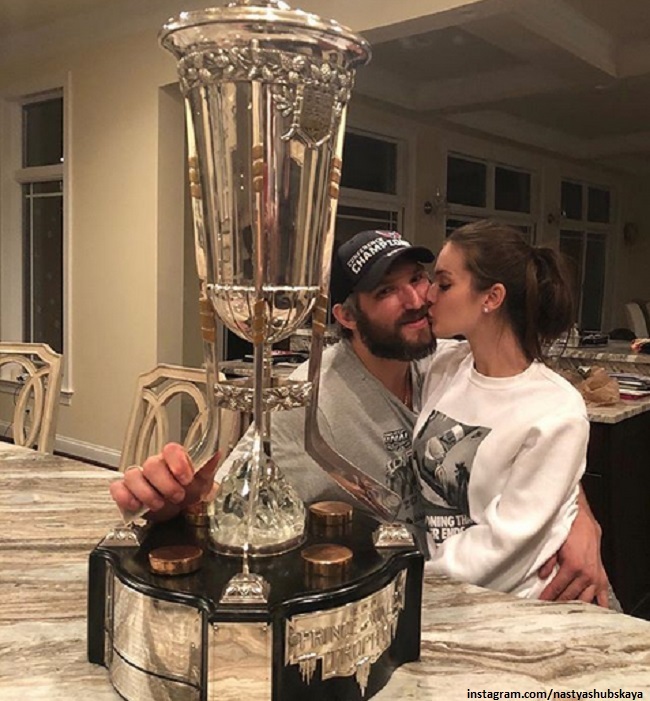 The Ovechkin family is about to get a new addition: the sportsman's wife is about eight months pregnant. Until now, Nastya hid the pregnancy as long as she could and did not tell the fans that she would soon become a mother. Now when her pregnancy is not a secret, Anastasia decided not to hide anymore and arranged a "pregnant" photo session. The daughter of the actress Vera Glagoleva posted a fresh picture on Instagram with the caption: "I wish you a nice day". In the picture Anastasia is seen in a light summer dress. The future mother flaunts her baby bump. Judging by hashtags, photo was made her older sister. Followers congratulate Anastasia on the pregnancy and and wish her happiness and health to the future baby. "This is the most beautiful and wonderful time. Enjoy every minute! ", Write the fans. By the way, pregnancy rumors began circulating on the Internet almost immediately after the wedding of Ovechkin and Shubskaya. Perhaps that's why the spouses hid the pregnancy as long as they could, preferring to enjoy the period without the public attention. It will be the first child for 32-year-old Alexander and for 24-year-old Anastasia. The future spouses knew one another for several years before the wedding: the father of the model Kirill Shubsky worked in the Olympic Committee of Russia. It was he who brought his daughter to the Olympics in Beijing, where Anastasia met Alexander. Hockey player Ovechkin came to the Summer Olympics as a guest - cheer for the Russian team. VGIK graduate Anastasia Shubskaya was considered one of Russia's richest brides: the girl's father, Kirill Shubsky - president of the insurance company "Soglasie-Alliance", his fortune is estimated at about 2 billion dollars. However, Ovechkin was no less enviable groom. In January 2008, he signed a $124 million deal with the Washington Capitals. Nastya's parents, Cyril Shubsky and director Vera Glagoleva, approved daughter's choice. Parents of Alexander immediately fell in love with Nastya. The magnificent wedding of Shubskaya and Ovechkin took place on 8 July 2017. Prior to Anastasia Alexander had been dating tennis player Maria Kirilenko for three years, the couple even announced the engagement. Athletes parted ways in July 2014. And in January 2015 Masha married a city official.